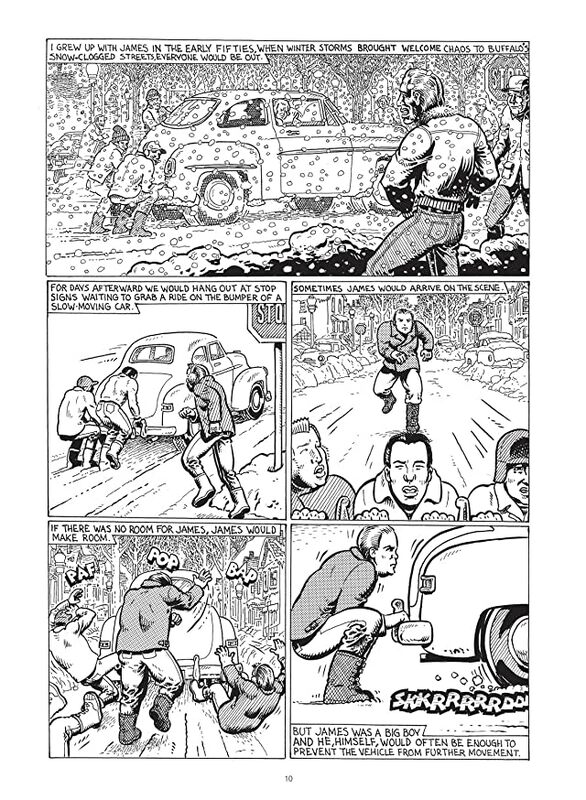 This was the world Manuel “Spain” Rodriguez lived for the first quarter-century of his life, and drew in meticulous detail for his entire career, long after he departed Buffalo to become one of the greatest artists and writers of the underground comics movement. 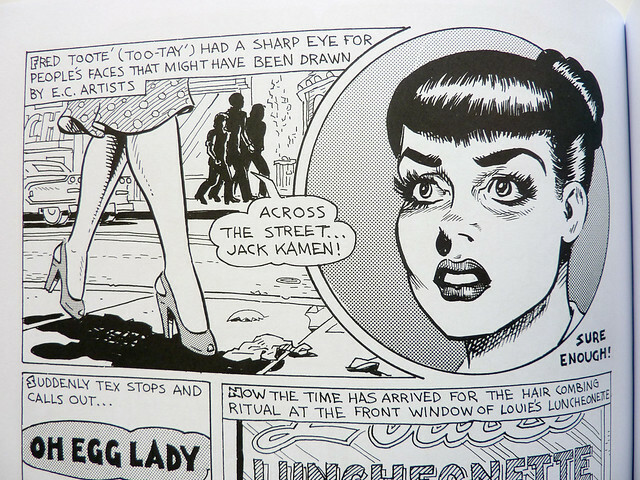 Illustrator, biker hoodlum, radical, janitor, music lover, machine operator, poet, thug, philosopher – Spain was all those things, as well as perhaps the most vivid chronicler of Buffalo life the city has ever produced. “Keep the flames of Buffalo burning,” Rodriguez said in a March 2012 interview, in preparation for a career retrospective at the Burchfield Penney Art Center. It was 45 years since he lived Western New York, but he had produced a couple of richly detailed autobiographical volumes recounting his youth there. 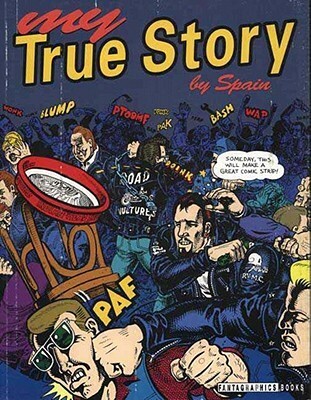 On the cover of the first, My True Story (1994), Spain is in a brawl at the Jamestown Bar on Allen Street, thinking “Someday, this will make a great comic strip!” On the cover of the second,Cruisin’ With the Hound (2012), he is in his friend Fred Tooté’s convertible as they roll down Fillmore and Box, past the corner Deco, their radio blasting the Hound on KB. Rodriguez, the son of a Spanish auto repairman and an Italian artist, grew up in an East Side neighborhood he described as Italian, Jewish, black, Irish, Polish and Greek. When he was 11 or 12 he participated in the usual Buffalo boyhood activities, like pogeying. But he also discovered comic books, at a time when government authorities condemned them as contributing to juvenile delinquency and the degradation of the morals of American youth. He drew throughout his years at East High School. At 20 he took a job on the factory floor at the Western Electric plant in Tonawanda and joined one of Buffalo’s biggest and most violent motorcycle gangs, the Road Vultures. It was 1960. For the next seven years Spain rode, worked, fought, partied, ate, drank, club-hopped, chased women and philosophized with his pals, the “North Fillmore Intelligentsia.” Decades later, after he had moved to New York (in 1967) and ultimately to San Francisco, he continued to re-create those episodes with acute clarity and insight in the pages of Zap and other underground magazines. In Trashman, a 2012 short documentary released just before Rodriguez’s death by his wife, Susan Stern, you can hear his Buffalo accent, still strong and proud after so many years. Through an entire lifetime, Spain Rodriguez always kept the old flames burning.